The Alfa Romeo twin cam engine from 1954 until 1997 This classic Alfa Romeo engine began life in the Alfa Romeo 750 Giulietta and evolved into the 2.0 Litre twin spark engine in the Alfa 75, 155 and 164, the engine has an Aluminium cylinder head and block and has some very nice design features. At its conception the engine had a displacement of 1290 cc, twin overhead camshafts and a twin choke carb and produced 80 bhp @ 6300 rpm, this was soon joined by its twin carb sibling which hiked the power to 90 bhp @ 6500 rpm with the aid of a tubular exhaust and hotter camshafts. For the 1955 saloon car, the twin choke carburettor was replaced by a single choke carburettor, this detuning of the engine reduced the maximum power to 53 bhp @ 5500 rpm. Soon however, the coachbuilders got hold of the engine, they soon increased the power, with Zagato producing probably one of the finest versions of the engine in the Giulietta SZ, the engine output was raised to 100 bhp @6500 rpm and the kerb weight of the whole car was reduced to 770 kg even today at nearly 130bhp per tonne this is a fast car. 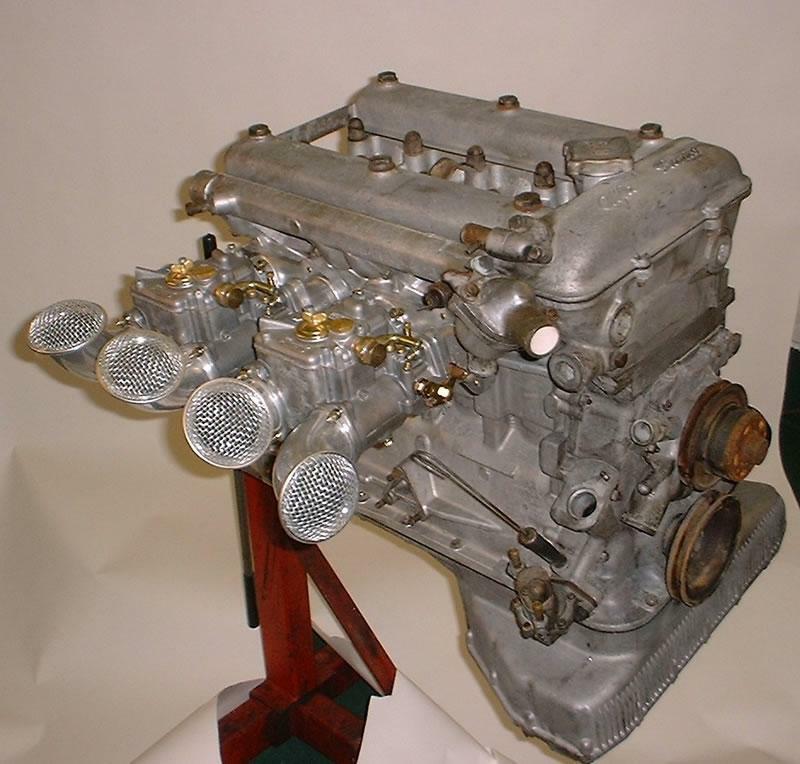 On the 27th of June 1962 the Giulia TI was introduced this had a 1600 cc version of the same basic design, however to aid mass production, increase reliability and reduce costs the design was changed subtly but substantially, the casting process was changed, the valve stem diameter was increased from 8 to 9mm the bore centres were changed the timing chain was lengthened the crank was modified and numerous other detail changes helped bring the power up to 92bhp @ 6200 rpm with a single carb and 109-112 bhp when the twin carb version was produced. Interestingly Alfa Romeo found that when they reduced the size of the ports at the time they changed from the Sprint GT to the GTV power increased. 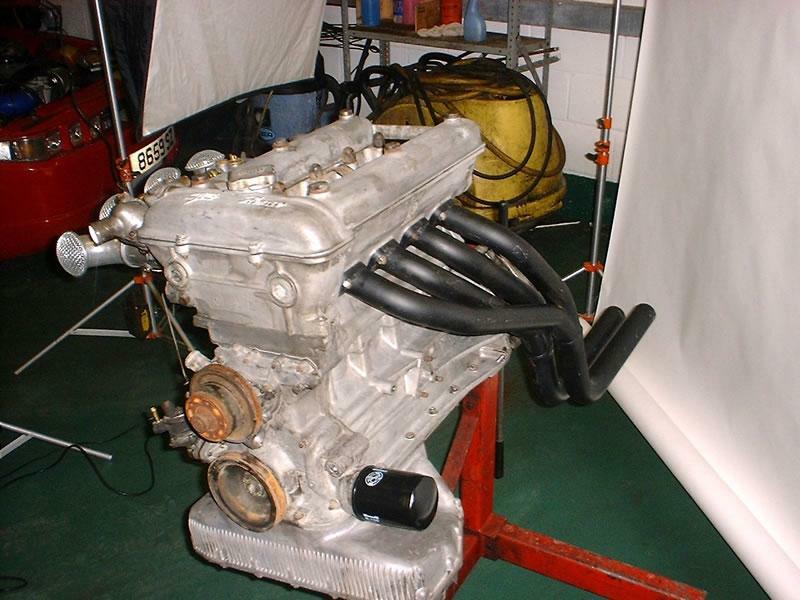 By the mid 1960s Alfa Romeo had started a racing program using this engine at first the engine was installed in the TZ1 and 2 and then found its way into the famous GTAs. These engines are particularly interesting but there are so many changes to the standard specification I will not cover them in this section, however in order to increase the power output it was found to be necessary to fit twin spark plugs to increase the rate of flame propagation a feature that was later copied in production engines. Next came the 1750 engine, which is in fact 1778cc but was named after the Alfa 1750 of the 1930s, power was again up this time to 122 bhp @ 5500 rpm, during the production run of this engine it was found to be necessary to offset the big end bearing on the con rod, this helped reduce piston slap. To aid reliability sodium cooled exhaust valves were fitted at this time, these help to keep the valve cool as the sodium melts and then transfers heat to the valve stem, this process was first used on Rolls Royce Merlin engines in World War two. The 1750 engine had a very short life as the flagship of the range, by 1970 it was replaced by the 1962cc engine this was the last capacity increase in the life of the production engine as by now there was no longer room in the block. The 1962 cc engine shared the same stroke as the 1750 at 88.5 mm but the bore was increased from 80 to 84mm taking the power up to 132 bhp at the same revs as the 1750. Alfa Romeo also changed the number of teeth on the ring gear and reduced the number of bolts in the flywheel from 8 to 6 this is an important point to note if you intend to use the 2000 cc engine in smaller capacity cars. The next changes were in order to fit the engine in the Alfetta chassis this involved fitting a different sump and oil pump, which was a shame as the 105 series car has a beautifully designed sump. The exhaust manifold is also changed to avoid the engine mounting. The Alfetta had a trans axle gearbox so there is no need for a spigot bearing for the gear box input shaft so on all Alfetta models this is omitted and on some cars there is no hole bored in the crankshaft for the spigot bearing, these changes make it difficult but not impossible to swap engines between Alfetta and Giulia models. The Alfetta gold cloverleaf of 1982 also used a version of this engine that was also technically very interesting as it was one of the first production cars to have variable inlet cam timing. The fuel injection system on this car had an output that, when the throttle was pressed adjusted the cam timing by 14 degrees, this effectively gave the camshafts a sportier overlap while still retaining a nice idle and low emissions. Briefly in the engines life turbo charging was used, first on the 1962 cc engine, in 1979 when it was fitted in the GTV turbo delta however only 331 of these were produced and again in 1982-3 it was fitted in the Giulietta these engines reputedly produced 175 bhp at 5500 rpm but they were primarily homologation specials. Then it was used on the 1778cc engine in the 75 Turbo America and the Turbo Evoluzione, this model was aimed at the world touring car series however the series only lasted for 1987. With the introduction of the Alfa 75 the engine was also updated and this was probably its biggest evolution yet, the engineers at Alfa Romeo developed the ideas that gave the GTAs there successes in the 1960s and produced the Twin Spark engine. While sharing the same crankshaft, bore and stroke as the earlier engine almost no part was left untouched. The block was changed as the number of oil ways up to the cylinder head was reduced from six to two making it impossible to change the heads from a twin spark onto an earlier model without major engineering work and the front timing chain cover was also narrowed a little. The cylinder head only shares the same valve sizes as the previous two litre. The compression ratio was increased the angle between the valves was reduced from 80 to 46degrees, the inlet camshaft now got variable timing and the shape of the combustion chamber was improved this increased the engines maximum power to 155 bhp and made it one of the most powerful 2.0 normally aspirated engines available at the time. The engine is still one of the classic engines of all time and still looks impressive in or out of a car. It is possible to change the engines from one car to another however it may take a little work. We have fitted twin spark engines in Giulia’s and Giulia engines in Giulietta’s. However it is nearly impossible to interchange parts between engines of different capacity’s or between Giulietta and Giulia or Giulia and Twin Spark.